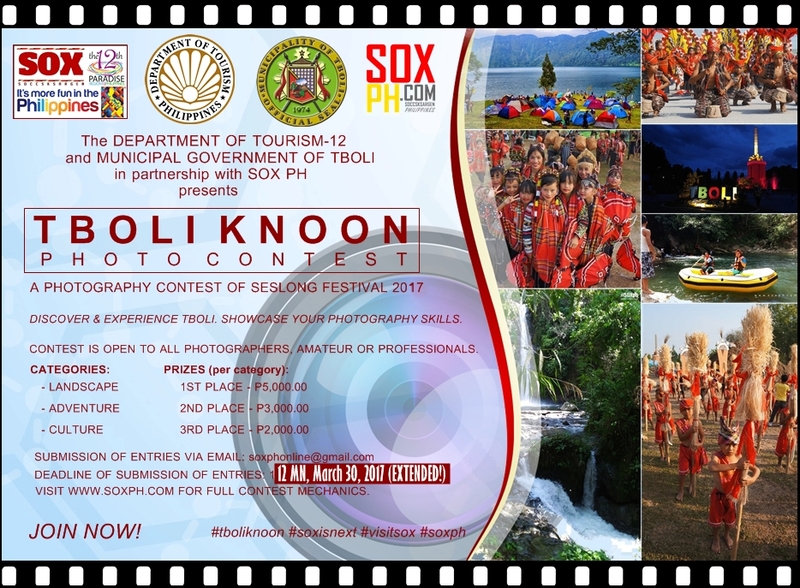 In celebration of Seslong Festival 2017 and the 43rd Foundation Anniversary of the Municipality of Tboli in South Cotabato, the Department of Tourism-12 and LGU- Tboli in partnership with SOX PH invites all interested photographers to join the 1st TBOLI KNOON PHOTO CONTEST! o Entries for this category must have been taken not earlier than June 1, 2016.
o Photos in this category must be taken not earlier than June 1, 2016. NO registration is required in joining this contest. Only basic enhancements like cropping, resizing, and minor adjustments in brightness and contrast will be allowed. Photo Entries should be submitted through email -- soxphonline@gmail.com not later than 12 MN of March 30, 2017. Entries must include a title and a brief description. TOP entries in each category will be uploaded at I LOVE SOX PH Facebook Page for the “MOST POPULAR PHOTO” Contest on April 5, 2017. Entry with the most number of likes during the voting period (April 5- 8, 2017) will be awarded “MOST POPULAR PHOTO” Award. Winners of the contest will be announced on April 10, 2017 . All submitted entries, winning or non-winning, shall become property of DOT-12 and maybe published or used for promotional purposes by DOT-12 and the organizers with due acknowledgement of the original owner. Discover & experience Tboli and showcase your photography skills for a chance to win exciting prizes!